this board is like new, the bindings have some wear in them, but the functionality is not hampered at all, simply visually worn. 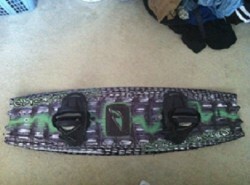 the board is a 2009 gator board, and has incredible pop off the wake, and smooth landings. it has a gator skin graphic on the top of the board.